At New York Fashion Week, flirty spring-winter hybrid looks were all the rage, but at the Burberry show during London Fashion Week, the tough-o-meter was turned up to high. 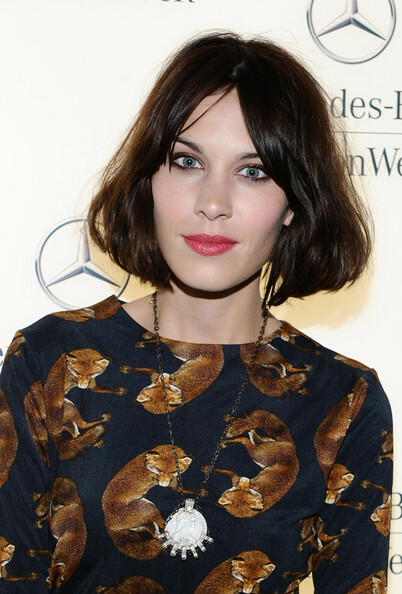 Alexa Chung, Daisy Lowe and Kate Bosworth all turned up in the brand's urban chic style. Alexa kept her look casual, with a navy sweater paired with luxe leather leggings. Daisy opted for a splash of bright pink, contrasted with a biker jacket and boots. Kate veered away from black and opted for camel, but don't the paler color had any less attitude—her skirt was fully decorated with some seriously sharp studs! All in all, three awesomely cool looks! Alexa Chung attends the Margaret Howell Show during London Fashion Week Autumn/Winter 2011 at the Margaret Howell Studio on February 20, 2011 in London, England. (UK TABLOID NEWSPAPERS OUT) Alexa Chung arrives at the ELLE Style Awards 2011 held at The Grand Connaught Rooms on February 14, 2011 in London, England. Model Alexa Chung attends the Mercedes-Benz Fashion Week Fall 2011 Official Coverage at Lincoln Center on February 10, 2011 in New York City. Alexa Chung attends the Chanel Haute Couture fashion show, held at the Espace Cambon, Paris. Alexa Chung arrives at the Etam Fashion Show Spring/Summer 2011 Collection Launch at Grand Palais on January 24, 2011 in Paris, France.